Thanks to Kira of Film and TV 101 for this recommendation. 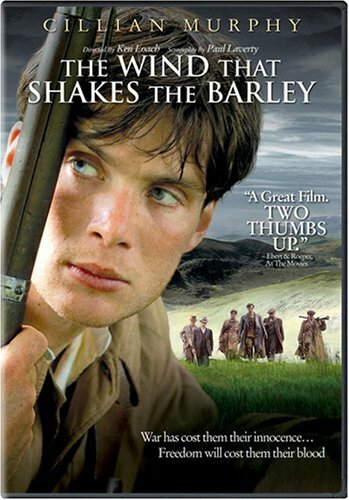 Brief Synopsis – A young Irish doctor gets involved in the fighting between the Irish people and the British government in the 1920’s. My Take on it – This is a film that I never expected to really like but was easily drawn in right from the very start. Cillian Murphy is great in the lead role because he plays a powerful figure yet at the same time he does so in a quiet manner. Despite this, we easily see where his loyalties lie throughout no matter what happens. They do an amazing job showing how war changes people both for better or worse and what they think when looking back on their own actions. The themes touched upon here will keep me pondering those issues for quite some time because they are so relevant to our world on a daily basis and translate so well for us. This film was truly deserving of the top honor at Cannes but I’m a bit shocked that it neglected to get much award love (even via nominations) that year. The film presents us with a mixed message about war and the bravery, loyalty and patriotism of each individual. We also get to see that there really is only a fine line between the oppressors and freedom fighters when we look at the methods and actions of what each side is trying to accomplish. There is a very high chance that will film will break into my top ten of 2006 and could possibly be my new #6 or #7… time will tell. Bottom Line – Great film that surprised me by how much I liked it. Murphy is great in this film because he is so powerful a figure yet soft spoken. The ideas of what war does to people and how it changes them later in life is shown extremely well here and it gives us all so much to think about long after the credits roll. Definitely deserving of it’s win at Cannes of the Palme d’Or but I’m a bit surprised that it lacked much award love besides that. Loved the mixed message here because it also makes you realize that there is only a slight difference between the oppressors and freedom fighters when looking at their methods and what they each are trying to accomplish. Highly Recommended! Tnx for suggesting it kira!